The restoration of Massey Shaw commenced in October 2008 after the Heritage Lottery Fund had confirmed our grant application. 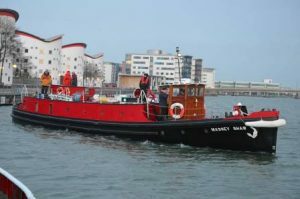 Permission to start the project was given in November 2008 and took just over 4 years to complete, with Massey being brought back to London in November 2014. February/March – Protective covers built to enable restoration to commence in all weather conditions at South Dock Marina, Southwark. May – Engines dismantled under the instruction of Society engineer. February – Steel plating at stern and portside removed. New plates cut ready for riveting. March – New tendering agreement confirmed with T.Nielsons in Gloucester. 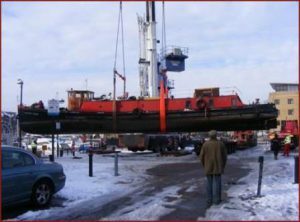 Massey transported to Gloucester dock via low loader. 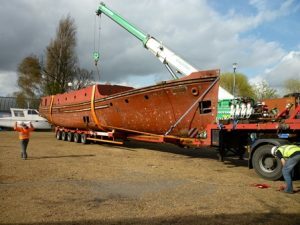 April – Work commences on riveting and replacement of hull plates. 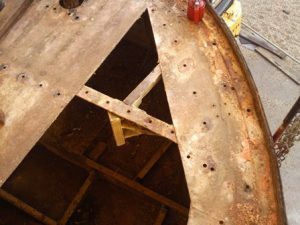 July – Internal fitting removed for restoration and to allow access for riveting. 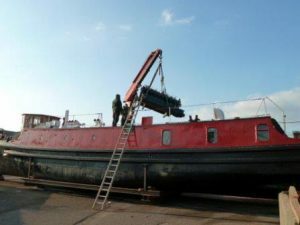 February – Engines removed from Massey to be sent to Gardner Marine, Canterbury to be rebuilt and tested. July – Painting of the hull after completion of steel work on the hull. 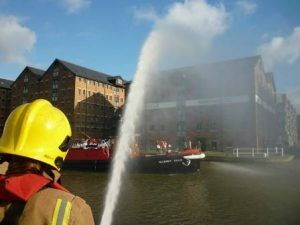 November – Volunteer training continues to prepare for the return of the boat. April – Volunteers assist with removal of deck fittings and other items for storage. January – Massey Shaw attends the London Boat Show at the Excel Centre as part of the historic ships display. February – Volunteer maintenance and training programs begin to prepare for up coming events. July – Volunteers attend Community event at the Westminster Boating Base to raise profile of the project.